Information literacy may be defined as the ability to identify a research problem, decide the kinds of information needed to tackle it, find the information efficiently, evaluate the information, and apply it to the problem at hand. Teaching Research Processes suggests a novel way in which information literacy can come within the remit of teaching faculty, supported by librarians, and reconceived as 'research processes'. The aim is to transform education from what some see as a primarily one-way knowledge communication practice, to an interactive practice involving the core research tasks of subject disciplines. This title is structured into nine chapters, covering: Defining research processes; Research ability inadequacies in higher education; Research processes and faculty understanding; Current initiatives in research processes; The role of disciplinary thinking in research processes; Research processes in the classroom; Tentative case studies in disciplinary research process instruction; Research processes transforming education; and Resourcing the enterprise. 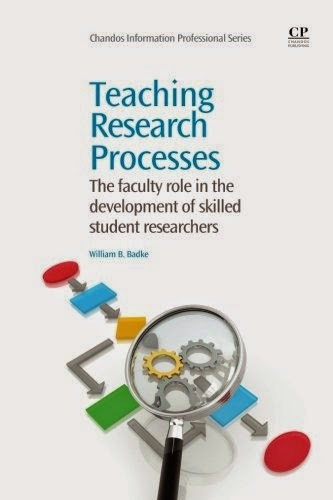 The book concludes by encouraging the reader to implement the teaching of research processes.